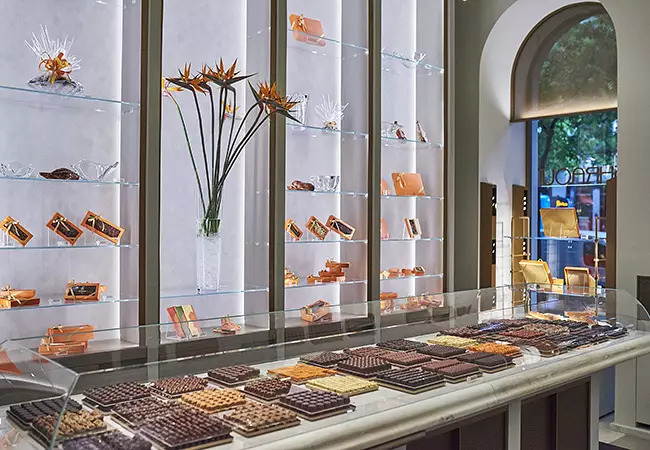 It’s hard to imagine anything more fragile than a Ghraoui chocolate creation: such as the delicate hand-painted violin or autumn leaves which seem ready to snap off at the slightest touch. And yet the family that makes them have withstood almost 200 years of challenges with an extraordinary fortitude in their ride from extreme success to utmost adversity. Founded in 1805, by a trading family in Damascus, the company introduced artisan chocolate to the Middle East in 1931. At first, they gained attention by offering small silver and gold trinkets with their boxes but later won over a devoted clientele with the quality of their confectionery. The family gained the title of Purveyor to Her Majesty, the Queen of England, and won many awards. Then came the tough times. Political instability led to a climate of austerity and sales plunged. In the 1960s the business was nationalised twice. Each time the head of the family stepped up to restart. Once more, their efforts were rewarded with international success. A few years after the turn of the millennium, Ghraoui chocolates were awarded the ‘Prix d’honneur’ award in 2005 at the Salon du Chocolat trade fair in Paris. Then came the biggest blow. The civil war that ripped through Syria forced the closure of the factory. On a short trip to Paris, Bassam S. Ghraoui and his wife Rania decided not to return home. Giving up on the business that had defined their family for so many generations was a prospect difficult to face. “After 200 years, the name Ghraoui has its own soul and determination,” says Mrs Ghraoui. And the story did not end. Living it spoke to the Ghraouis last month after they opened their new luxury boutique on Andrássy Avenue in Budapest, Hungary where they have found a new home. “I remember clearly in 2012 when we left Damascus, we said to ourselves: no, no, it is not going to be us, who will let the name Ghraoui down, we will not give up,” says Mrs Ghraoui. The artisanship is still undeniably Syrian with former colleagues and confectioners with decades of experience crossing the Mediterranean to recreate the business. “We have somebody here working with us for 18 years now and we call him “the new guy” – observes Rania. 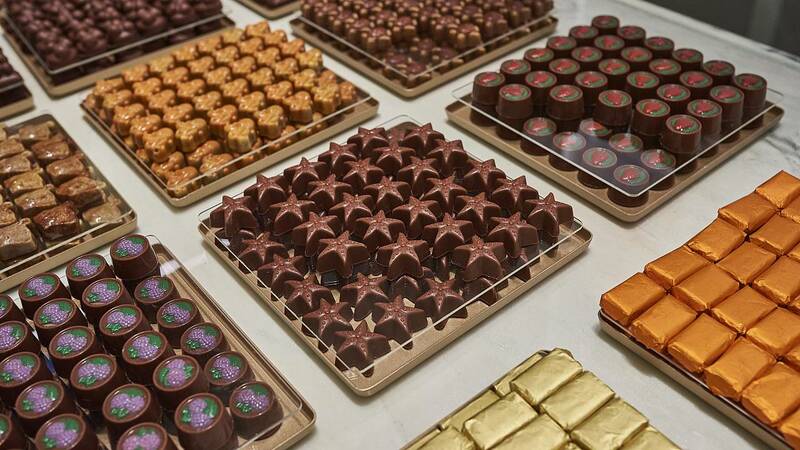 The business employs 65 people; they work on the unique combination of the chocolate and the fruits coming from the Levant. The way of treating the fruit is the company’s unique know-how dating back 200 years. “The majority of the products are a marriage between the Levant and Europe,” Mrs Ghraoui says. The cacao comes from the Dominican Republic, the chocolate is 85 percent pure, and the goal is to keep the added sugar at a minimum level. The Ghraoui’s approach to luxury and detail is epitomised by their choice of designer for their shop in Budapest. “One day Bassam was wandering through Paris and he entered a Cartier boutique. He was fascinated by the design, the work of Bruno Moinard,” Mrs Ghraoui relates. 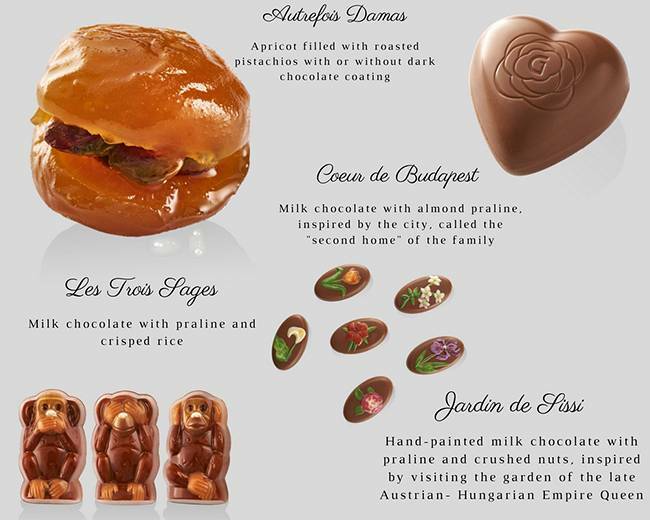 “He kept track of works and had the impression that this designer can capture what luxury means, even in the smallest details of his creation.” After receiving an invitation accompanied by a box of chocolates, Moinard was inspired to visit Budapest and create a store based on a fusion of the city’s historic houses and landmarks and the heritage of Damascus. The next step for the family is a second shop in Paris in February and another in Dubai after that. But the dream remains to re-open their shop in Syria. And the Ghraoui family are not known for giving up on their dreams.